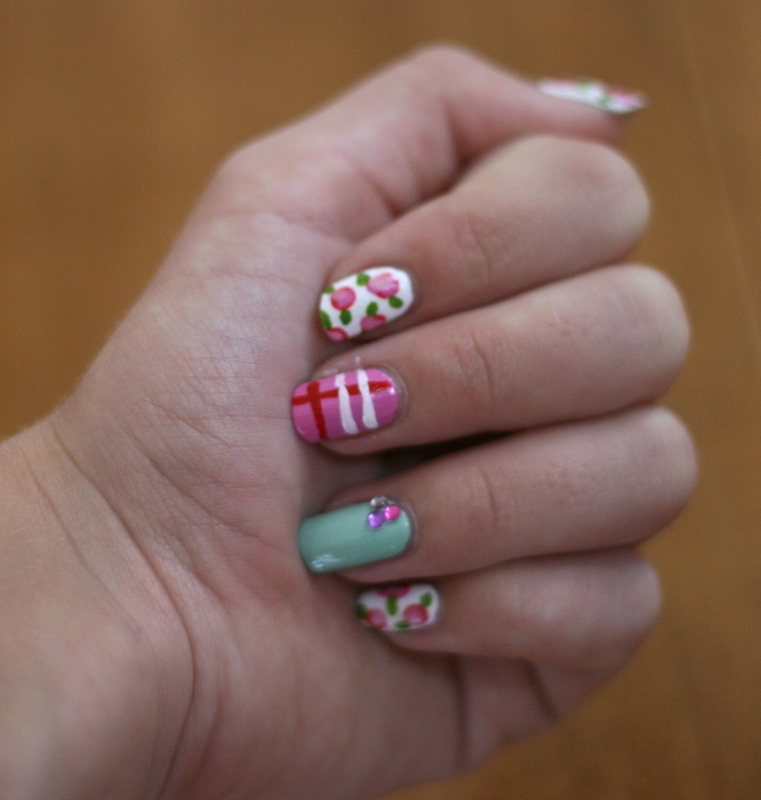 Yesterday I saw a nail art idea on Pinterest and decided to give it a try! It is super cute and I am very satisfied. Though it took some patience and time, the end product is amazing and so cute! This is probably my favorite nail art that I’ve ever tried. Let’s take a look! How To Create This Nail Art! For this design, you will need several different polishes and tools. First, paint your thumb, index, and pinkie nail white. Add two or three coats of the white polish. Take a pink polish and paint it just on your middle finger. Now, take a mint green polish and paint it onto your ring finger. After they all have dried, you can start the designs! I first took a dotting tool and created little dots on all of the white nails. I used a bright pink (almost red) polish that reminds me of candy! These dots are not meant to be perfect either! Once you are finished with those, take the same polish you used on your middle finger and a dotting tool and create little C’s. After that has dried, I took the dotting tool and a very light pink polish and placed that around the pink C’s. Next, I took a nail brush and a light green polish to create the stems. Try not to make them look like dots! For the middle finger, I took a red striper and painted a line straight down, slightly by the left side. Then, create another red stripe going the opposite direction, by the lower part of the nail. For the ring finger, apply some gems (choose any color you like!) and you are finished! If you have any questions, please let me know and I will gladly answer them!